2 Convenient Locations to Serve You! Home » What's New » Are You Ignoring Your Dry Eyes? 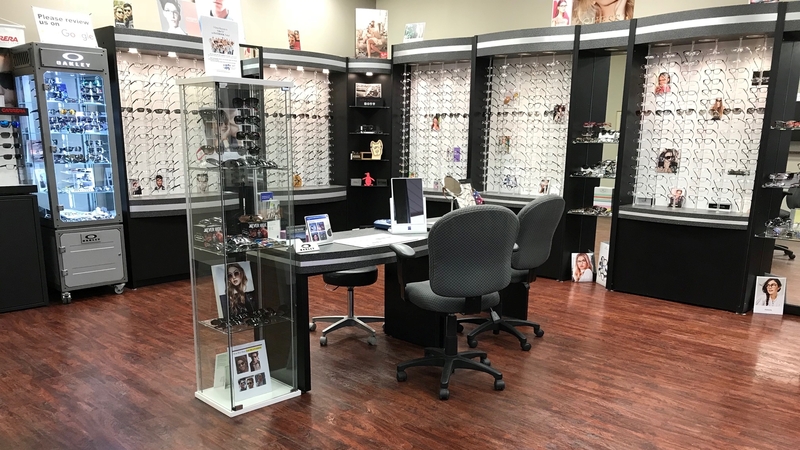 Donate your old eyeglasses and you will receive a $5 credit toward the purchase of new glasses or contact lenses. Glasses collected by the Lion’s Club. Have you noticed that your eyes feel chronically dry, itchy, scratchy or even sometimes watery? Many people that have these symptoms just go on with their lives until the symptoms become unbearable. 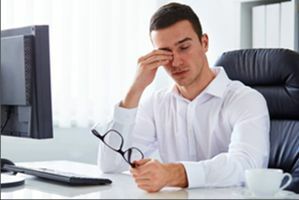 What they don’t realize is that these are signs that they might be suffering from dry eye syndrome, a condition in which the eyes are not able to produce enough tears to effectively lubricate the eyes. This is a problem that won’t just go away on its own. Dry Eye Syndrome, also known as Tear Film Dysfunction is characterized by a reduction in the amount or quality of tears that are produced. Tears are essential for optimal eye health, vision and comfort. 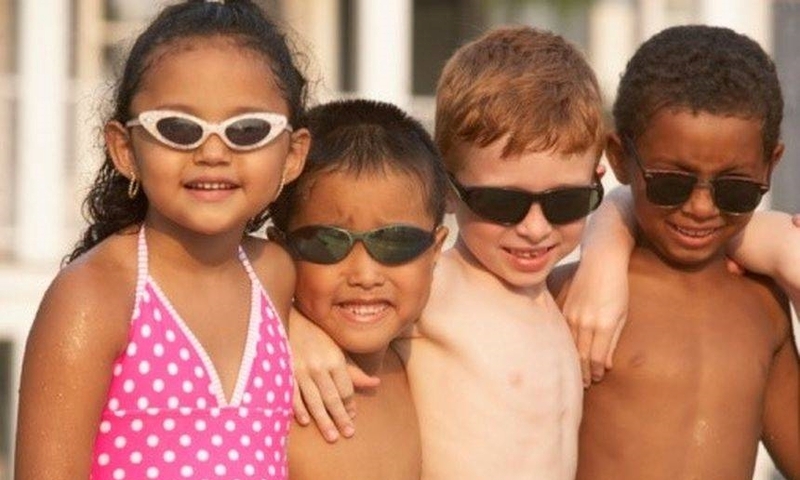 Ideally, tear film covers the eyes at all times to prevent the eyes from drying out and to ensure clear vision. If the glands that produce tears start to produce fewer tears or tears that don’t have the proper balance of water, oils, proteins and electrolytes, the tear film with become unstable, allowing dry spots to form on the surface of the eye, and cause disruptions in outer barrier of the eye’s epithelial surface. This disruption in the outer barrier allows microbes to invade the eye, leading to irritation and infection. The condition can be caused by many factors, including tear gland dysfunction, eyelid problems, medications or environmental factors. 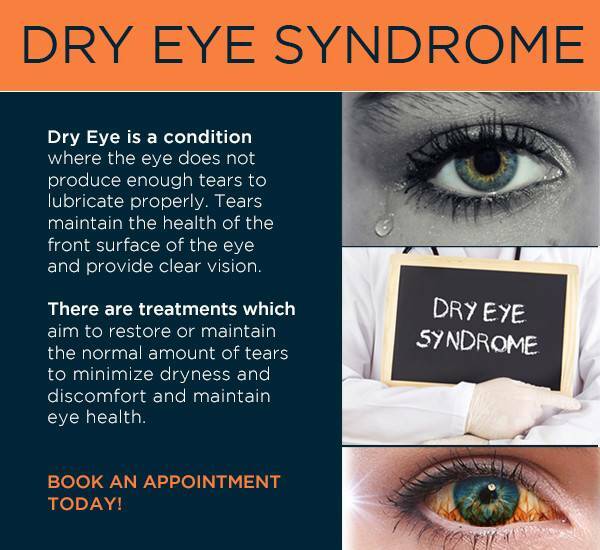 As mentioned above, many of the symptoms of dry eye involve varying sensations of dryness including, burning, stinging, itching, grittiness, soreness or a feeling that there is something in the eye. The eyes may also be red and sensitive to light, wind or smoke. Vision may be blurred or doubled and the eyes may fatigue easily. 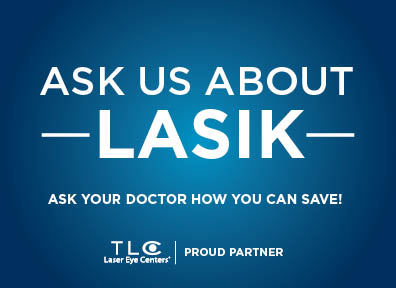 Another common symptom is that vision seems blurry but clears when you blink (especially common when reading or using a computer). This is because the tear film does not form a smooth coat over the eye surface or it evaporates too quickly causing a blur. You may also notice pain, some discharge from the eye (especially upon waking in the morning) and experience discomfort when wearing contact lenses. One of the most confusing symptoms of dry eye is actually excessive tearing, which occurs because the eyes are trying to compensate for the lack of moisture – however the tears produced are low quality and don’t properly hydrate the surface of the eye. Important! Never stop medication without the approval of your doctor! If you are taking a medication that may be causing dry eye, don’t stop taking the medication without speaking to your healthcare provider first. Treating dry eye symptoms may be a simpler solution than stopping or switching medications. Exposure to dry, windy climates or blowing air (such as an air conditioner or heater). 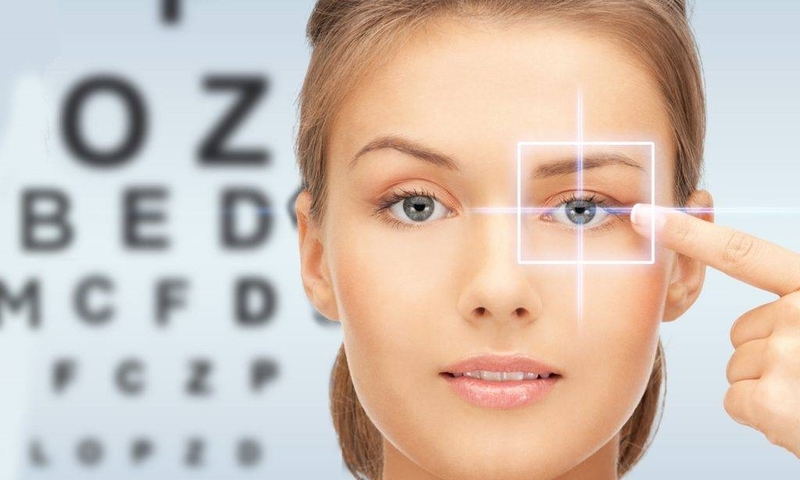 If you are experiencing dry eye symptoms, make an appointment with your optometrist. 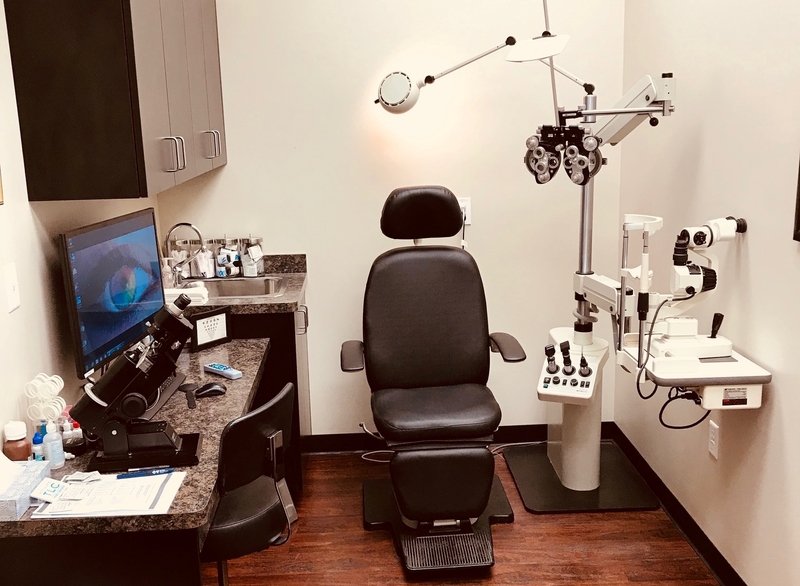 The diagnosis and treatment will be based on a complete examination of your eyes, your medical history and your personal circumstances around the condition. 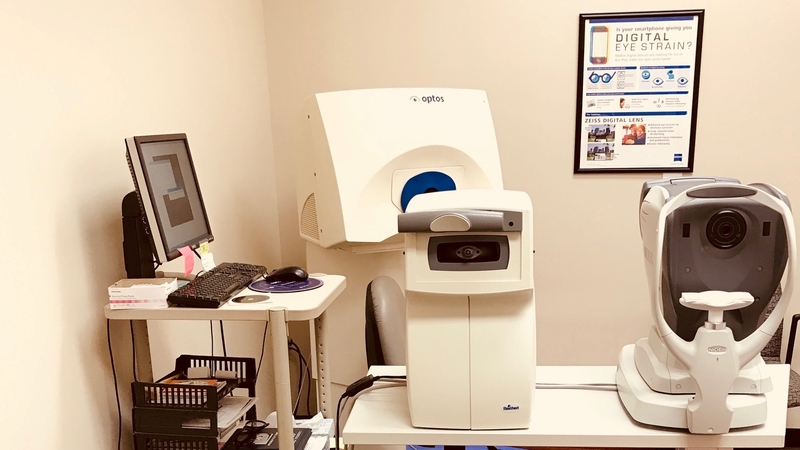 The doctor may decide to perform a tear film test that can determine the quantity and quality of the tears and whether your tear glands and tear film are functioning properly. 1675 N. Canton Center Rd.